Within the pages of Ibironke Tolu-Ogunpolu’s new book, Daughter Shine Forth!, ($11.99, paperback, 9781545606377; $20.99, hardcover, 9781545606384; $5.99, e-book, 9781545606391) readers will realize they can and should aspire for and achieve so much more than what they think they deserve. The author proves, through stories from her own personal journey, that God’s plans are always so much bigger and better than His people can fathom. Ibironke Tolu-Ogunpolu is a mentor for professionals. She helps them overcome challenges and grow into exceptional, Christ-centered leaders. She has also enjoyed a successful career in consulting for a Big 4 firm, which has offices in several countries. Her passion is to share how God has worked in her life and the importance of accepting God’s grace. Xulon Press, a division of Salem Media Group, is the world’s largest Christian self-publisher, with more than 12,000 titles published to date. 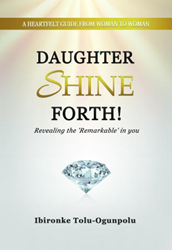 Retailers may order Daughter Shine Forth! through Ingram Book Company and/or Spring Arbor Book Distributors. The book is available online through xulonpress.com/bookstore, amazon.com, and barnesandnoble.com.